The mid-season harvest has been utterly abundant. I’ve done far too many jars of sour cherry preserves (none of which seem to want to set... live and learn . I did a late night stint making black raspberry jam. 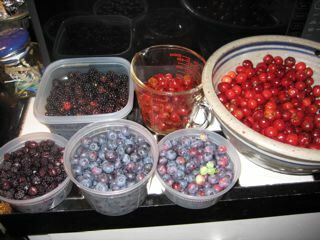 I still have more berries to decide what to do with. The blueberries ripen a little more each day. Today was 2 1/2 pints for the evening picking and I’m doing better at getting at some additional canes of blackberries that have decided to grow up through the holly. Prickly picking for sure. Once you start the process of jelly or jam making you have to see it through. It’s been a couple of wee hours jobs to get everything in jars with more to come. I’m grateful, with all other living costs taking a bit of an upward path these days, that I have the land and the plantings to provide such abundance. I just hope I survive the harvest. I want to have grapes as well. Good varieties for the East and Pennsylvania. It may be a tough thing to add these and strawberries to the list. I failed completely so far at getting the space cleared for the colonial garden. There are a couple pumpkin plants going wild but the tomatoes and this season’s, or what should be this season’s, leeks are still in market packs or small pots.